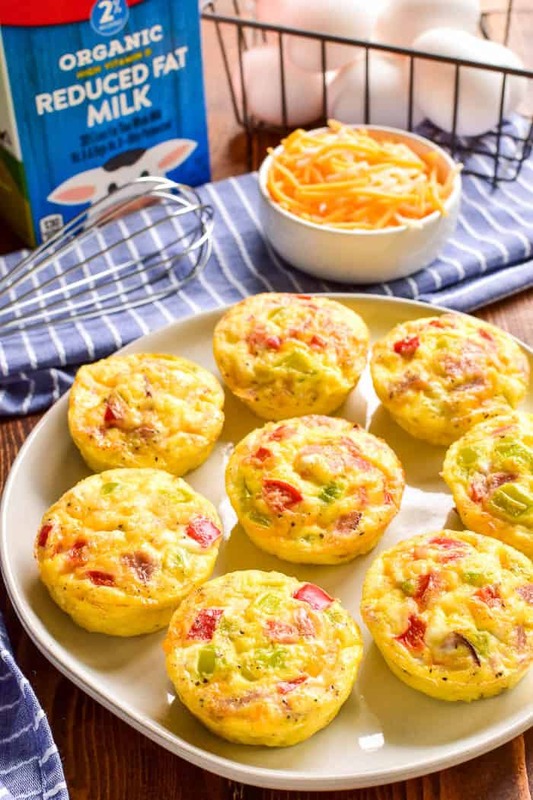 These Ham & Cheese Egg Muffins have all the right ingredients: eggs, ham, cheese, peppers, and Horizon Organic Milk. We’re big on Horizon Organic, and have been ever since we realized the importance of buying organic dairy. There are so many benefits, from environmental to health to animal rights. And once you understand them? You’ll never go back. WHY SHOULD YOU BE BUYING ORGANIC DAIRY? It’s better for the environment. Organic rules are designed to conserve wildlife, maintain or enhance soil & water quality, preserve the diversity of plants and animals, and encourage use of wholistic and natural farming practices. It’s better for our health. Organic dairy is non-GMO and free of antibiotics, growth hormones, and toxic or persistent pesticides. All of this equates to product that’s better for our health. It’s better for the cows. Organic cows eat a diet of organic food and spend a minimum of 120 days/year grazing. They have access to the outdoors year-round and are provided with shade, shelter, exercise, fresh air, and direct sunlight. They’re kept in clean, healthy, low-stress environments, and producers must use approved preventative healthcare treatments and practices. 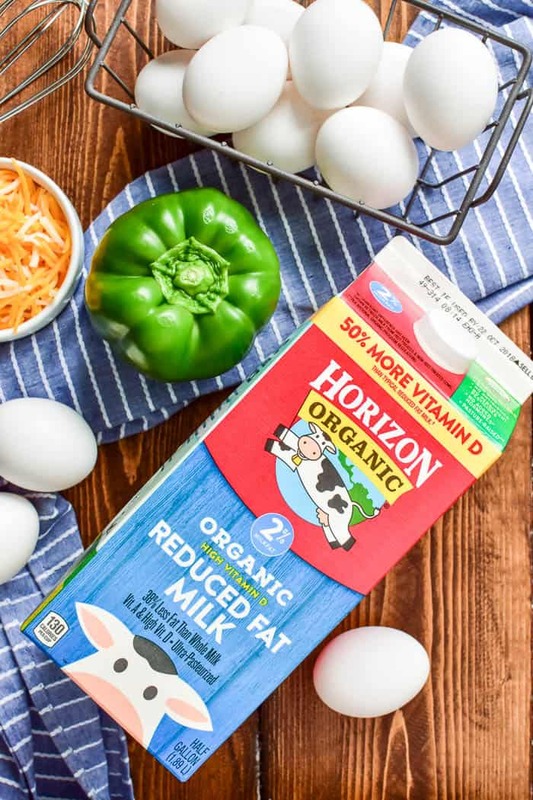 WHAT OTHER ORGANIC DAIRY PRODUCTS DOES HORIZON MAKE? In addition to organic milk, Horizon makes organic cheese, yogurt, cream, butter, cottage cheese, sour cream, and even eggnog. These Ham & Cheese Egg Muffins are perfect for busy mornings. Loaded with all the best breakfast ingredients, these muffins are an easy grab ‘n go option that everyone loves! My family loves eggs for breakfast…any way we can get them! From Overnight Sausage Egg Casserole to Bacon, Egg & Cheese Monkey Bread to Crustless Quiche Lorraine, we’ve never met an egg recipe we didn’t like. And we especially love egg muffins! All of these recipes can be made with Horizon Organic milk and are great for back-to-school. Can we talk about back to school schedules for a second? Because seriously I AM DROWNING! Between back to school events and sports practices and appointments of every kind….my schedule literally could not be busier. And let’s not even talk about mornings. With 4 kids in 3 different schools….you probably have a sense of how crazy our mornings feel. And how necessary it is to have EASY go-to breakfast options like these Ham & Cheese Egg Muffins! They come together quickly and are made with just a handful of ingredients….and best of all, they’re easy to make ahead and they reheat beautifully in the microwave or toaster oven. 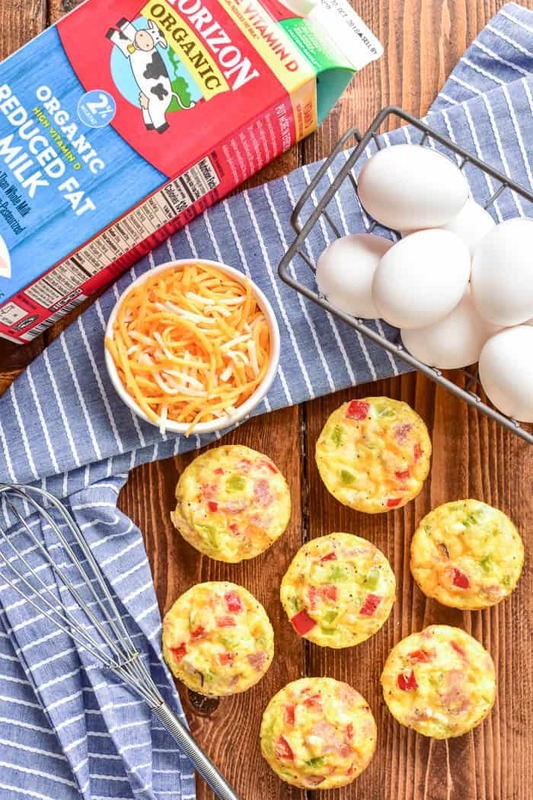 If you’re looking for an easy, delicious breakfast that’s great for weekday mornings, weekend brunch, and even holidays…these loaded Ham & Cheese Egg Muffins are a recipe the whole family will love. HOW DO YOU MAKE HAM & CHEESE EGG MUFFINS? In a large mixing bowl, combine 10 large Horizon Organic Eggs, 1 c. Horizon Organic Shredded Cheese, 3/4 c. chopped ham, 1/2 c. chopped bell peppers, 1/3 c. Horizon Organic Milk, 1/4 tsp. salt, and 1/4 tsp. pepper. Whisk well. Grease a 12 cup muffin tin and divide egg mixture evenly among muffin cups. *You may need to use 2 tins, depending on size. Bake egg muffins at 375° for 18-20 minutes or until centers are set and edges are golden brown. Remove from oven and use a knife to loosen muffins from tin. CAN YOU MAKE EGG MUFFINS IN ADVANCE? Yes! These Ham & Cheese Egg Muffins are perfect for making in advance and can be stored in the refrigerator or freezer. Simply reheat them in the microwave for a quick and easy breakfast! HOW DO YOU STORE EGG MUFFINS? 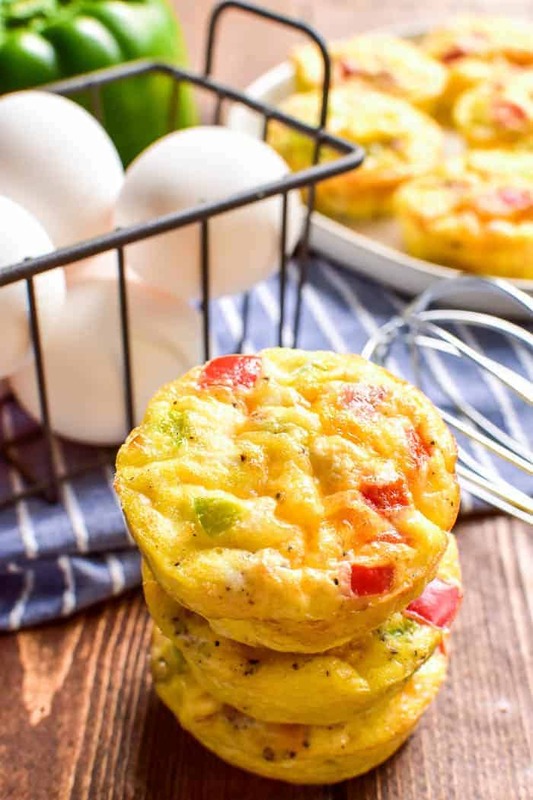 Egg Muffins should be stored in an airtight container in the refrigerator or freezer. Looking for more Egg Muffin recipes you might enjoy with Horizon Organic milk? 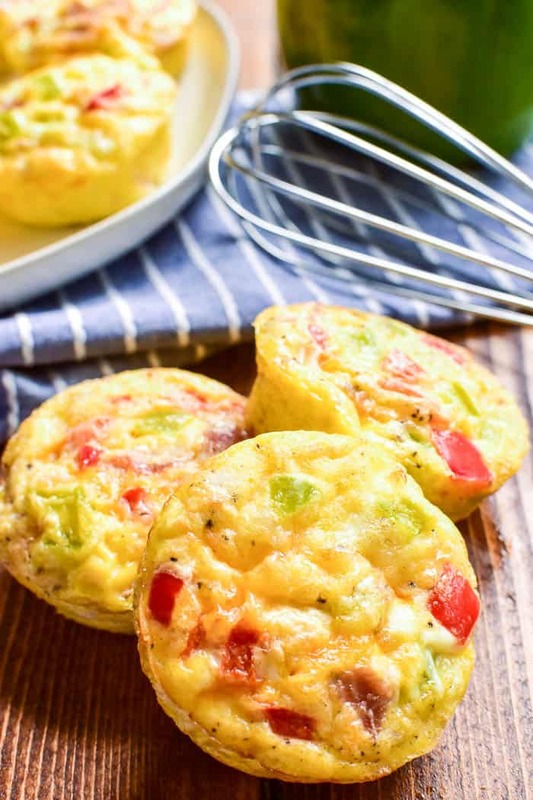 Check out these Veggie Egg Muffins and another of our favorites, these Breakfast Egg Muffins! 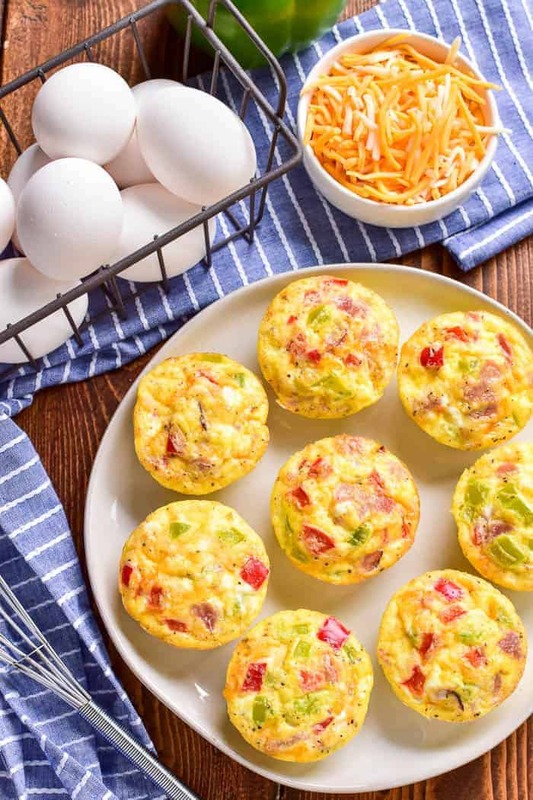 These Ham & Cheese Egg Muffins are perfect for busy mornings. Loaded with all the best breakfast ingredients, these muffins are an easy grab 'n go option that everyone loves! My kids cannot get enough of these on school mornings they are so good! These are perfect for on-the-go busy mornings! I like this! It sounds delicious. I️ just drooled. Cannot wait to try this! These look like a healthy and delicious way to start our days! These are perfect for these crazy busy back-to-school mornings.